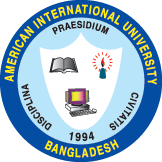 On 22nd November 2015, IEEE Industrial Applications Society (IAS) AIUB Student Branch Chapter presented a seminar on “Importance and Current Status of Mixed Signal Verification with an Overview of Chip Design Flow in Semiconductor Industry” at Building 2, Faculty of Engineering, American International University-Bangladesh (AIUB). The seminar was aimed at introducing mainly final year students to the semiconductor industry. Mr. Shahriyar Masud Rizvi, Assistant Professor, Faculty of Engineering, AIUB initiated the seminar by introducing the distinguished guest speaker, Dr. Henry Chang, Co-founder, Designer’s Guide Consulting. Dr. Henry Chang is an expert in design and verification methodologies and next generation tools and has worked at Cadence Design Systems Inc and Micro Linear and GE Lighting. He is on the steering committee of the IEEE Custom Integrated Circuits Conference and holds 10 US patents. In his talk, Dr. Henry Chang discussed about the semiconductor industry, the process of chip design that is followed in industry and the importance of verification. He elaborated on the various kinds of verification such as transistor level and hierarchical verification and also highlighted the current status of mixed signal verification in the industry. Mr. Enayetur Rahman, CEO of Ulkasemi Private Limited also gave a short presentation on the services provided by the company and how it is a bridge between Bangladesh and Silicon Valley, home to the world’s largest high-tech corporations. Ulkasemi is a technology design services & solutions company offering services in ASIC, Custom IC with its headquarters in California and ASIA design center in Dhaka – Bangladesh. Mr. Enayetur Rahman discussed about the importance of creating demand for semiconductor industries in Bangladesh and encouraged involvement of Universities and the students who are interested in the field. The seminar concluded with an interactive question and answer session. Dr. Md. Abdur Rahman, Director and Associate Professor, Faculty of Engineering, AIUB presented Dr. Henry Chang and Mr. Enayetur Rahman with tokens of appreciation for their time and participation. Tokens of appreciation were also presented to Verification Engineers from Ulkasemi Private Limited, Mr. Shakerin Ahmed, Alumnus, AIUB; Mr. Farshad, Alumnus, AIUB; Mr. Naveed Mahmud, Mr. Shimul Barua, Ms. Tasnuva Hasan and Mr. Ataus Shafi. The event was graced by the presence of Prof. Dr. A. B. M. Siddique Hossain, Honorable Dean, Faculty of Engineering, AIUB & Advisor of IEEE AIUB Student Branch; Dr. Md. Abdul Mannan, Head of Undergraduate EEE program, Faculty of Engineering, AIUB; Mr. Nafiz Ahmed Chisty, Assistant Professor, Faculty of Engineering, AIUB; Mr. Shahriar Hasan, Lecturer, Faculty of Engineering, AIUB and Motivator of IEEE AIUB student branch; Mr. Tawsif Ibne Alam, Lecturer, Faculty of Engineering, AIUB and Mr. Subrata Biswas, Lecturer, Faculty of Engineering, AIUB.